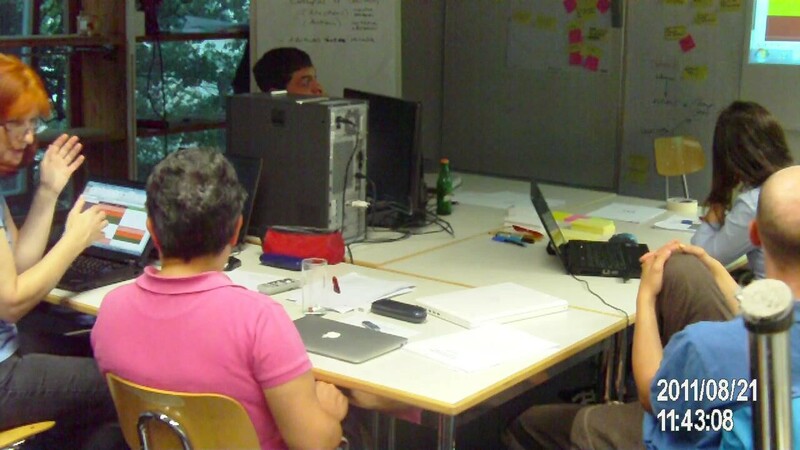 This case study is the result of a workshop with the title "Modelling a conversational storyworld" which was conducted during the Summerschool 2011 in Wiesbaden, Germany and was finally implemented in the Scenejo system. The user finds himself/herself on a party where everybody seems to know Peter who’s not there. 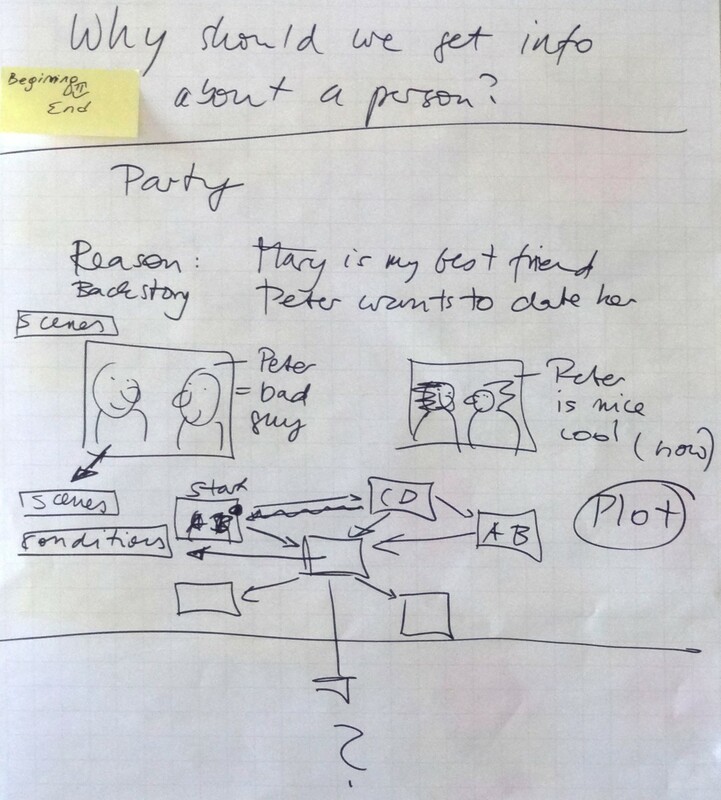 The user has to find out about Peter and use gained information to dig even deeper into the interesting and adventurous life of this mysterious Peter. 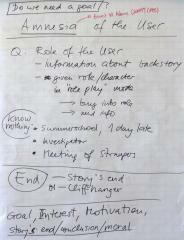 Similar to "Office Brawl" and the "Killer Phrase Game" an important early step is to find topics and example dialogues. The picture below shows a snippet of this process. The text below is part of an example dialogue and below it a screenshot of that dialogue running in the 3d version of Scenejo is shown. Martha: Are you enjoying this party? George: Well this is the party where we have to be. Martha: In this case Peter should expect huge donation. George: He he, well as the best friend it is enough to support him morally. Martha: I know why you two are friends. User: Good evening, I am glad that I was invited to this party. George: Oh, as a good friend of Peter I want to welcome you! User: Thanks! How do you know Peter? George: Oh! He is my surfmate. Martha: Really, I thought you are just a good chef for him. How long have you been surfing? George: Around four five years I guess. User: So you must know Peter well. George: Yes, I know Peter well. But probably you should ask Martha, cause she knows him better then me. User: You could tell me something about Peter. Martha: Well. Dont think he is a good guy just because of this chairity. George: Come on Martha, he is a good guy. User: You seem disagree on him. Martha: Dont let you get fooled by his good manners. George: He is a great surfer. And a pleasent company. Martha: Have you ever sailed together? Because I dont find him good at team work. George: No we are mostly surfing. 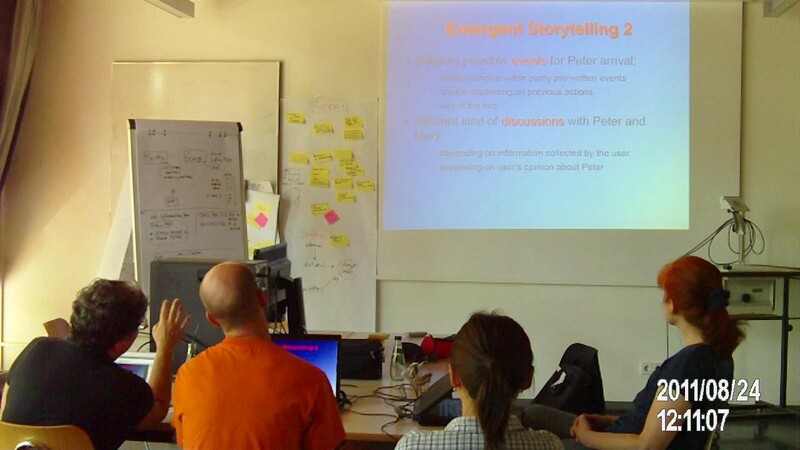 The creation process started with the collection of story ideas suitable to be implemented in this particular environment, that is, stories that would make sense and result interesting even though completely based only on conversational acts. 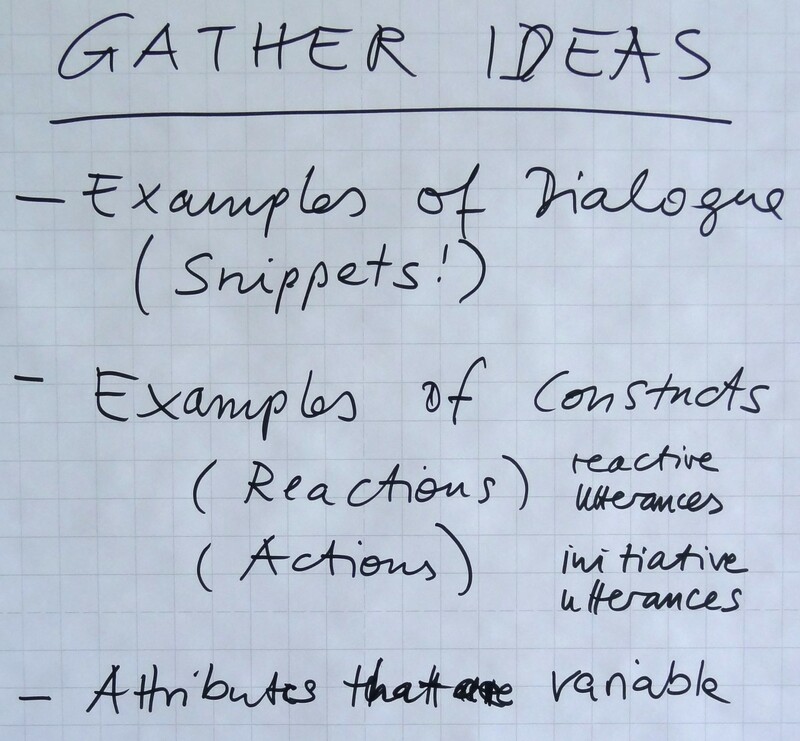 Moreover, the planned conversations should be apt to make space for a meaningful involvement of the user, that is, give her/him a reason to take part in the conversation, yet be sufficiently constrained to lead her/him to ask questions or make claims that the system would be able to handle so as to give rise to a globally consistent dialogue. 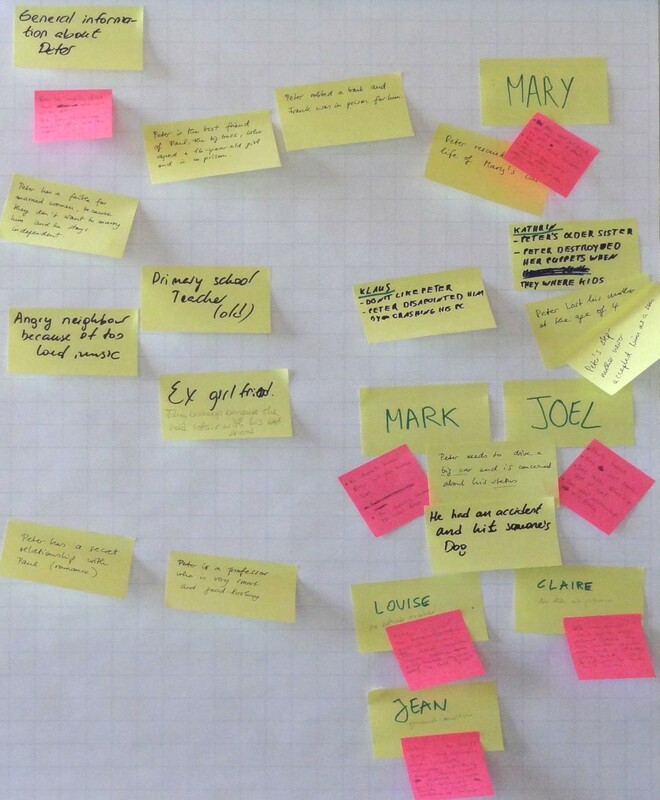 So the group decided to focus the conversation on some topic on which the user would have to ask questions, as for instance asking information about a person. But why should the user need to gather information about a person? In which situation(s) would such activity make sense if carried out in real life? And what characters would it be meaningful to involve in such information-gathering activities, so as to give rise to interesting and believable dialogues? How should such dialogues develop? Group brainstorming on such aspects filled up the firs workshop session and was carried out with the help of the paperboard. 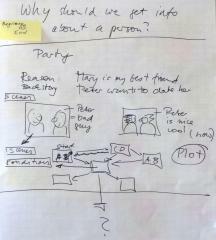 When the group reached the agreement to let the user ask information about a guy named Peter (as specified in the Story summary below), it was time to start developing the dialogues, that is, to start getting familiar with planning a conversation without scripting it, so as to let it emerge, in possibly different forms, during the interactions at run time. This was not easy at the beginning, and entailed more brainstorming and long discussions, since such task resulted unusual to all group members and the temptation to completely script parts of dialogue was always peeping in. This highlighted the need to define a number of variables to keep track of what is going on in the story and by this means control the possibility of the various utterances to be activated or not. 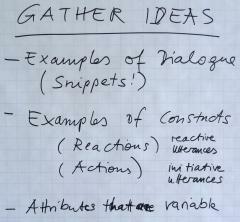 There is no fixed number of variables to be set up, but they depend on what aspects the story author wants to give space to; for instance, if one wishes to stress emotions as source of conversation behaviour, variables should be defined to collect characters’ emotional states (e.g., a character may increase its “angriness” state whenever a bad word is said, and when a certain level of angriness is reached the character reacts in some way, such as leaving the conversation). 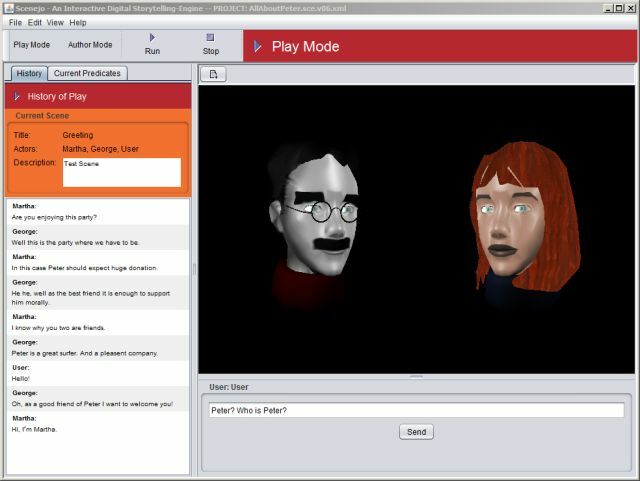 Dialogues should therefore be planned by specifying possible reactions to sets of possible utterances, as illustrated in the figure below, which shows (greeting) conversation acts and reactions planned for Martha and George, two virtual characters who, in our story, give the user information about Peter. 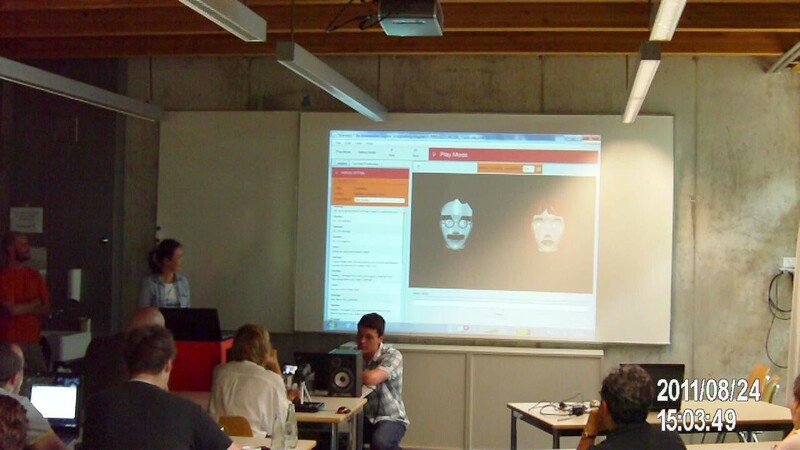 The story realized during the summer school workshop was kept simple, due to time constraints, i.e., it includes only 2 virtual characters who exchange a limited number of utterances. 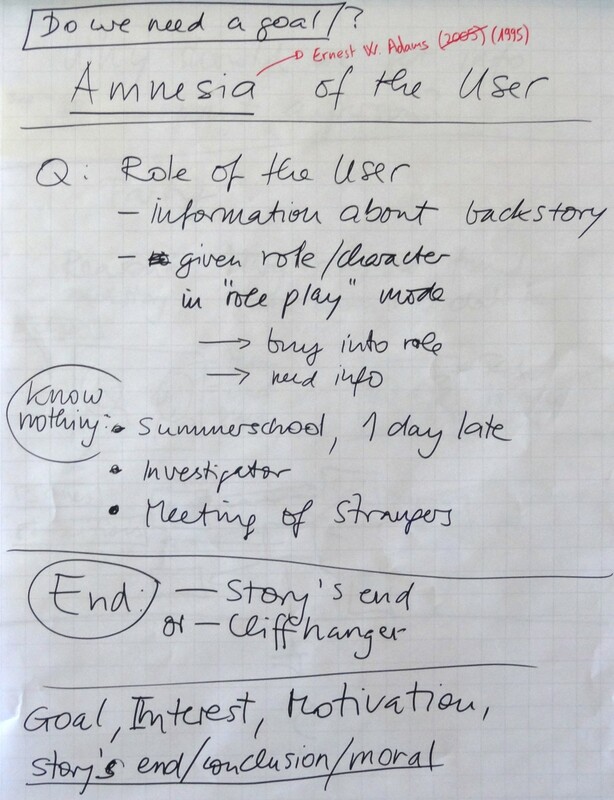 The whole story conceived, however, which was presented at the end of the summer school, was longer and more complex, including a variety of virtual actors with different characterizations, as well as 3 possible endings, yet still respecting the limitations imposed by the authoring tool used. Scenejo is accessible in the dowload area on the Scenejo Homepage. 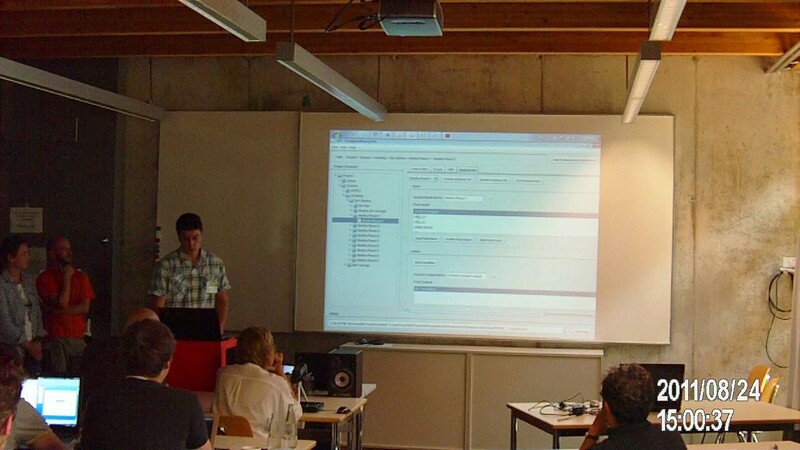 Scenejo Authoring Tool is accessible in the dowload area on the Scenejo Authoring Tool Homepage.